Holiday Inn Express, North Hollywood. One of the strangest juxtapositions of new development and old crap can be seen in the San Fernando Valley east of Lankershim on Burbank. A new six-story Holiday Inn Express is going up on the south side of Burbank Blvd. 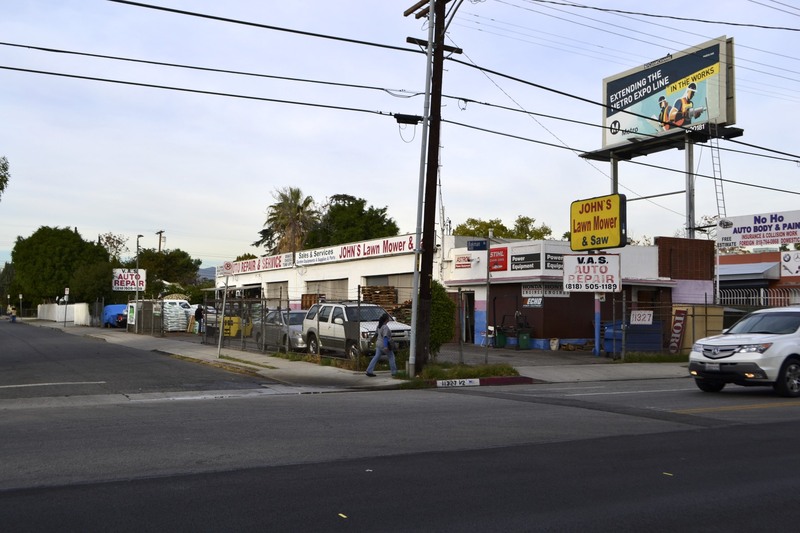 within view of the “arts district” yet firmly within the auto zone of muffler, tire, transmission, oil change, lawnmower and auto sales dealers. Imagine you are a naïve guest, perhaps from Iowa, who is coming to Los Angeles for the first time and you see this modernistic, multi-colored Mondrianlike building on Trip Advisor. 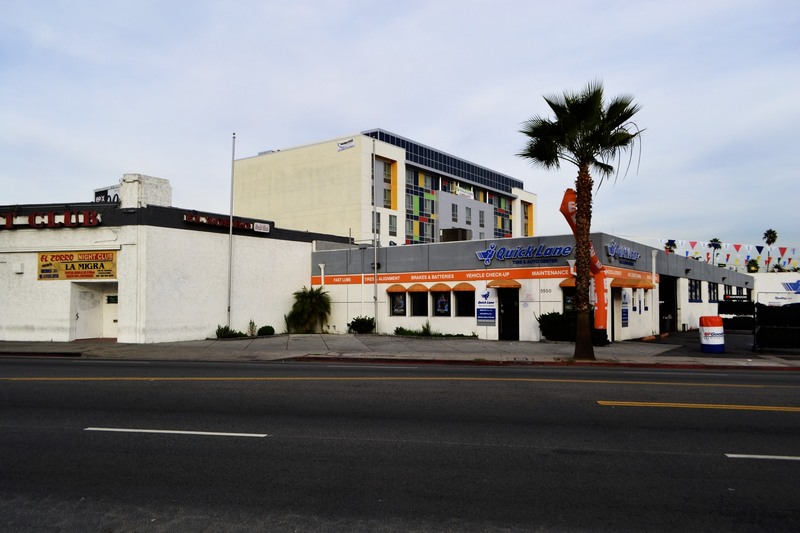 You might be excused for believing that you had lucked into a real fine deal, a lovely, clean hotel with good rates right in the heart of North Hollywood. 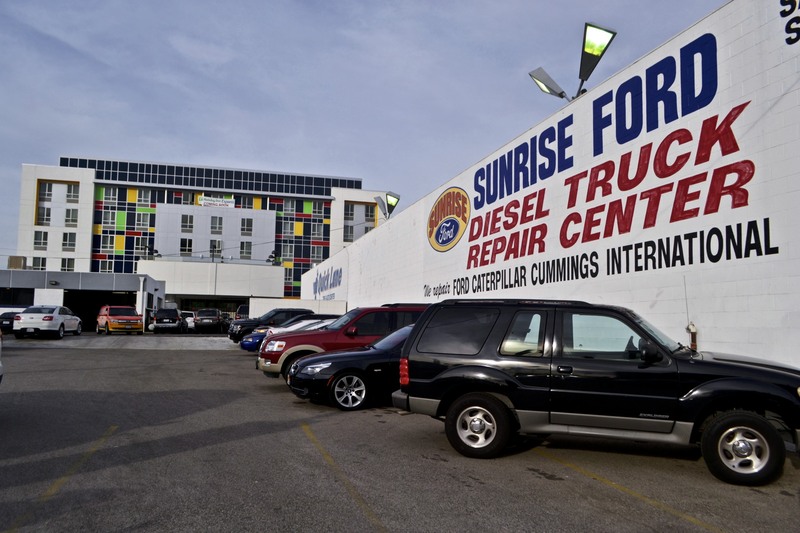 Upon checking in, you drive up Lankershim, past Sunrise Ford with its bright red painted “Diesel Truck Repair Center”. 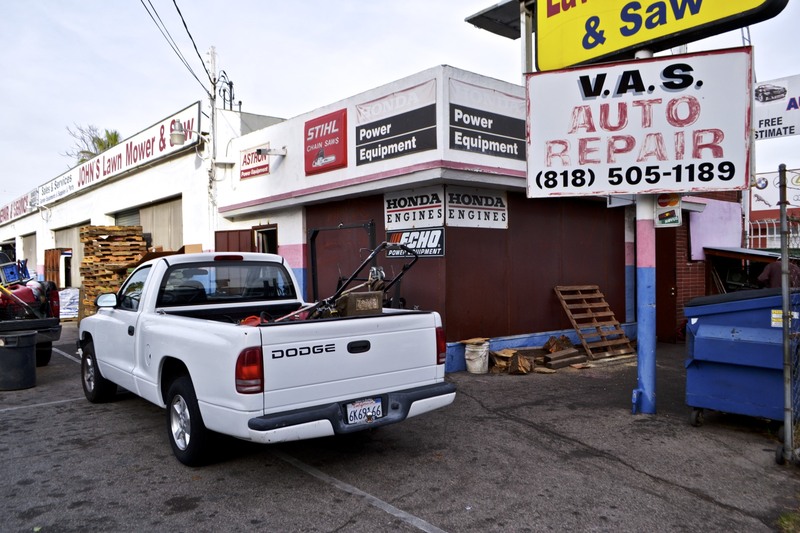 You go up to your room and look out and see V.A.S Auto Repair and John’s Lawn Mower with its garages full of grease monkeys changing oil, servicing radiators, and loading up pick up trucks with power equipment and lawn mowers. 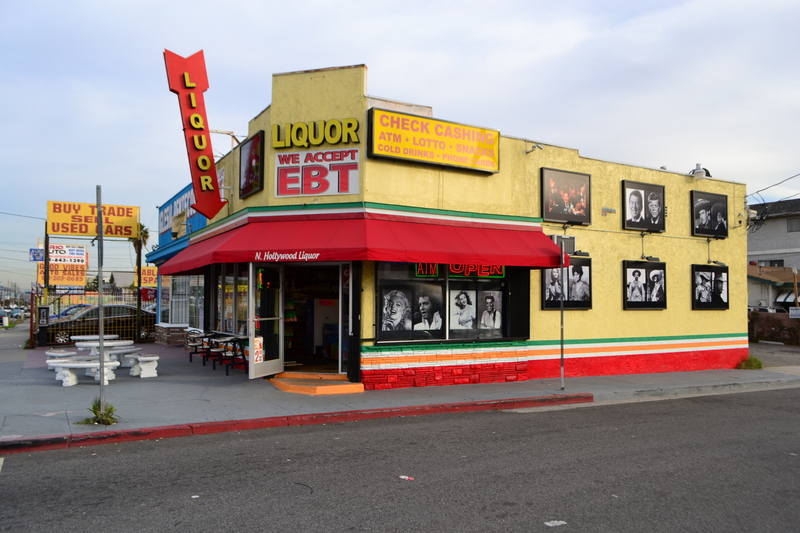 If you are getting hungry, after walking through all the paint and gasoline fumes, and breathing in the smell of diesel, you can pick up something to drink at N. Hollywood Liquor where they accept EBT and can also cash your check for a fee. 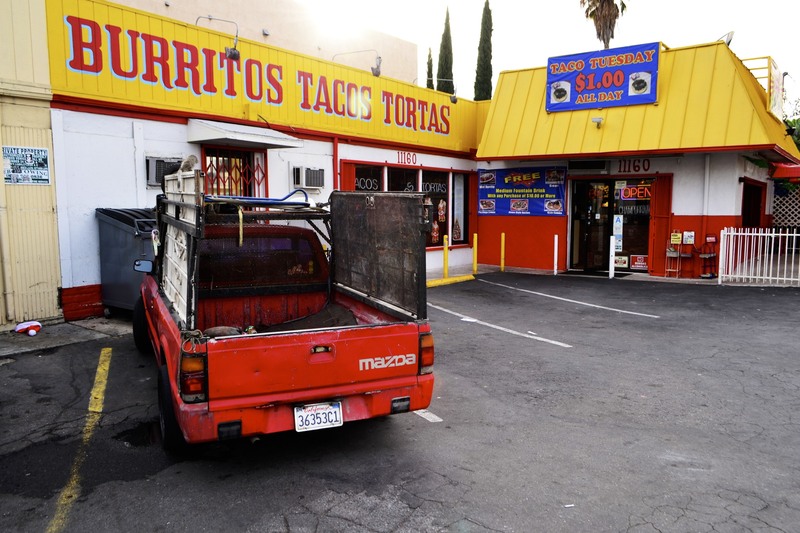 For a stroll you might stop by for a bite to eat at Tacos Manzano where Taco’s Tuesday is only $1. 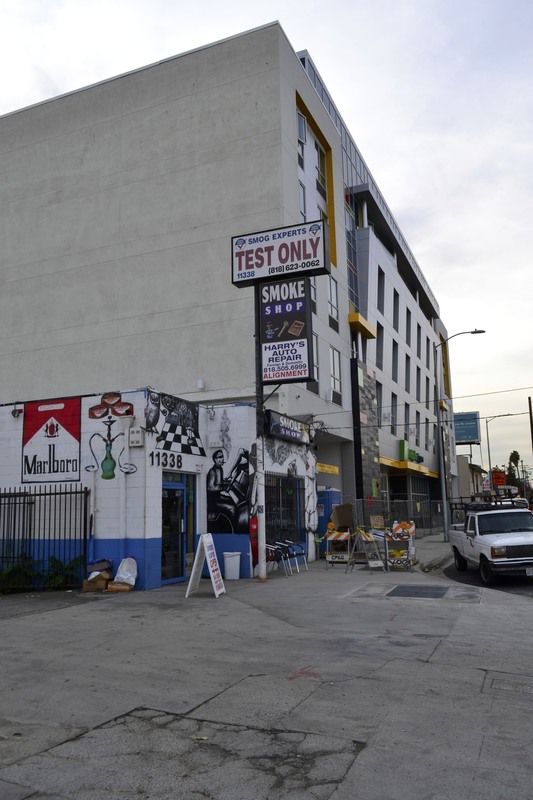 Or go directly next door to the Smoke Shop or Harry’s Auto Repair where the smog experts work behind cinderblock murals of Marlboro cigarettes and hookah. Pick up some pot at any of the medicinal pharmacies along the way. Marijuana is to modern Los Angeles what rice is to China. If you don’t want burritos on the cheap you can have a more expensive burrito at Los Burritos or go across the street and get an American style burrito burger at Denny’s. 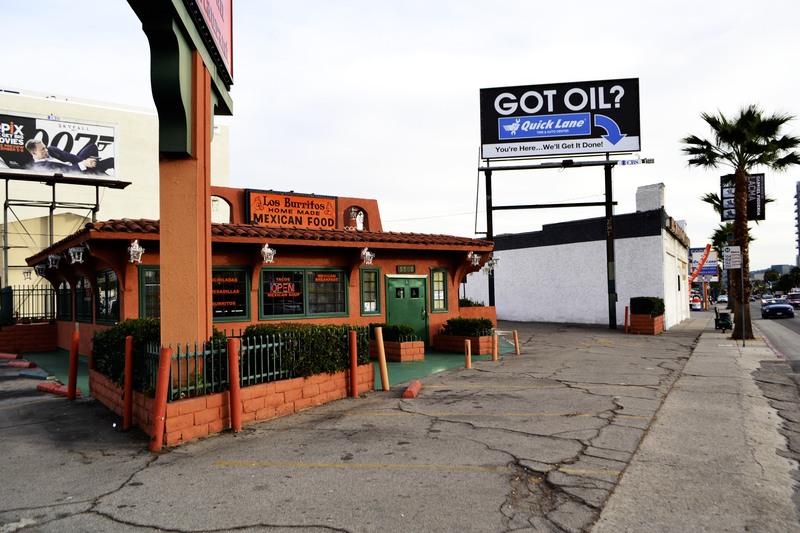 If you crave nightlife you can go to El Zorro nightclub right next door to the Quick Lane Tire and Auto Center. In another 50 years, a new generation of vaca negras will waddle past here, orange drinks in hand, and wonder if that bad old motel with prostitutes and vagrants will ever be torn down. it’s not so bad — you can walk to magnolia and to the metro red station, and it’s a quick bus ride to universal; so if the price is right, maybe it’ll be a decent alternative for people visiting l.a. without a rental car. i can think of worse places. Redevelopment needs to start somewhere. 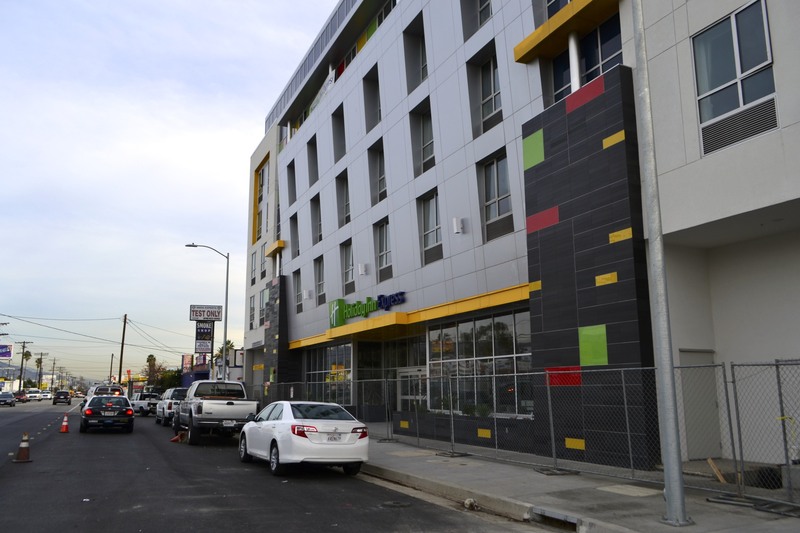 ← Keyes Van Nuys Rents METRO Busway Parking Lot.